, a trip to the dentist can seem downright terrifying! Such patients need dentists and team members who can compassionately meet their unique needs. As the parent, you are the expert on your child’s physical and emotional support needs. That’s why we’ll communicate with you before the first visit to determine the best steps to take. We encourage our parents to call our office and discuss the special concerns and needs they may have, so we can make the best plan together. Some children are helped by scheduling early in the morning. Likewise, scheduling on days that are less busy than others helps ensure a less overwhelming experience. We also offer a picture gallery online. With pictures of the inside of the office, the doctors, and team members, your child can review at home as much as needed what to expect before the big day. These can be printed out and used the day of the visit, too, to help your child track where they are in the sequence of events during their appointment. Transitions for all kids are difficult! To help reduce the types of transitions your child has to make during a visit, we’ll have one team member come greet the child, take x-rays, perform the cleanings, and be present during the doctor exam. The child will have comfort with one, increasingly familiar face being by their side, and caregivers will know whom to approach should they have a question. Our team members are trained in giving clear, simple instructions so children know how they can help the visit move quickly and smoothly. Our team members share what to expect: textures, tastes, amount of time, etc. In addition, we Tell, Show, then Do. The goal is to minimize any unpleasant surprises for the child. We understand that sometimes a kind word help more than 100 clear instructions! Our team members give encouraging, positive feedback to empower your child’s sense of self while in our care. We believe there is always a positive to be shared! In addition to our exceptionally trained doctors and team members, we have some little extra comforts that can help. Many children with special health care needs find extra comfort a weighted blanket has to offer in a stressful situation. We have different weights to meet different children’s needs. Many patients find comfort and distraction with a favorite movie. Each of our hygiene and treatment chairs has its own screen. If we don’t already have your favorite movie here, feel free to bring your copy from home. 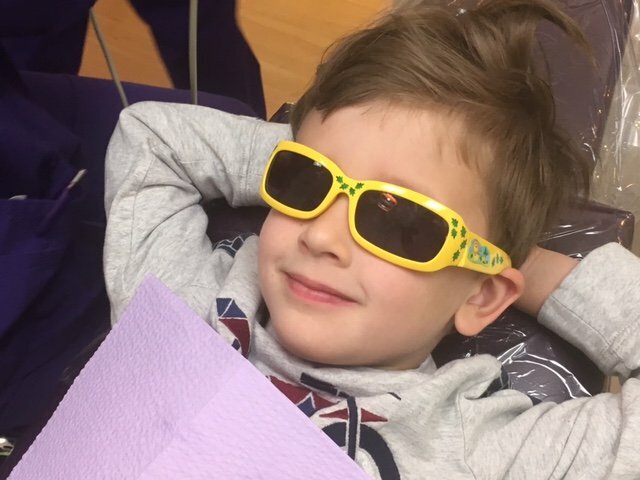 Even with all the best preparations, some children with special health care needs still may find the traditional dental visit too stimulating or stressful to continue. In these cases, rest assured we understand. We can still help! Our doctors can schedule your child’s dental care to be performed while your child is under general anesthesia. This option may also be the right choice for some patients to minimize the number of visits needed to care for all of their oral health needs. We’d love to see if our office is a fit for your special needs child. Feel free to call our office at 330-425-1885 to discuss your child’s specific needs. Our team members will be happy to assist you. This blog is for informational purposes only. It is not intended as medical advice.